The New Zealand Customs Service is getting closer to completing a major modernization project, called the Joint Border Management System. The system has two key components: the development and implementation of the New Zealand Trade Single Window; and advanced risk and intelligence capability, including new tools to provide sophisticated data mining, risk rating, and pattern analysis. In February 2015, the New Zealand Customs Service (NZCS) updated WCO News readers on the progress of the (NZD) $104.1 million Joint Border Management System (JBMS) project, which it is undertaking in partnership with New Zealand’s Ministry for Primary Industries (MPI) – responsible for managing the biosecurity risks posed by cargo, craft, passengers and mail items, including risks associated with imported food. At the time of the update, a significant proportion of the Trade Single Window (TSW) initiative had been delivered for food safety, biosecurity and Customs purposes. I can tell you good progress has been made since 2015, with three areas of the JBMS project completed or substantially completed. In July 2015, further functionality to the TSW was added, to allow brokers to register and manage some of their own and their clients’ information, and for supplier codes to be issued through the TSW. Before this addition, NZCS issued client codes to importers, exporters and overseas suppliers, and to organizations or individuals who wanted to submit messages to the system. These were applied for on forms that were generally faxed or emailed to NZCS for data entry. Allowing supplier codes to be issued online has been hugely beneficial for traders using the TSW. It has reduced what previously took up to one business day to issue, down to a matter of minutes. We no longer hear ‘stories’ of someone trying to get a supplier code late on a Friday, but having to wait until Monday for it to be sorted out. Letting industry get on with their business, and allowing it the freedom to manage certain information in the TSW has been hugely popular and efficient. The ‘flip side’ for Customs is what was previously a manual process is now largely dealt with through the TSW, allowing officers to focus on more high value work, and for future costs associated with manual processing to be avoided. A further milestone was reached in November 2015, when a significant upgrade to our offline risk and intelligence (R&I) analytics toolset and data repository to support its use was deployed. This technology has enabled a joint border analytics team to be established (November 2016), which consists of Customs and two fellow border agencies, Immigration New Zealand and the MPI respectively. Establishing a joint team allows the agencies to share the cost of specialist resources and leverage the R&I capability and tools of the three agencies, to gain new insights into border risk through the use of analytics and data sharing. Literally millions of border transactions are now being interrogated to identify patterns in data that represent border risk. A good proportion of that data is being generated through the TSW, which uses electronic craft and cargo reporting, and clearance messages based on Version 3.2 of the WCO Data Model (WDM3). The available data will grow with the completion of the last major release of the TSW in early 2017, which will include new ‘lodgement’ types, the term used to describe the different sets of information required. The quality of data will increase even further once the use of WDM3 message sets by traders to submit information becomes mandatory. Initially, NZCS has decided to target methamphetamine smugglers. For this, we have built a predictive model, in consultation with Australia’s Department of Immigration and Border Protection, centred on air cargo data. While early results are promising, time and more data is needed to prove it. As our capability and capacity grows, further predictive models will be developed, including models for revenue risk and other drugs. More investment in the area of data analytics is certainly required to build from our current state, but it is the tools, and understanding from the JBMS project, that have given us a good head start. Another example of the push in New Zealand for better coordinated border management (CBM) is that it should be driven by intelligence-led risk management. This intelligence-led approach underpins what NZCS and its fellow border agencies do in an ever-changing border environment. But, the collaboration is not just limited to gathering intelligence, as in many locations, New Zealand’s border agencies have co-located staff, and are sharing resources more than ever. The new way of working is not just confined to the New Zealand border. Closer ties have been established with many Customs administrations around the world, including Australia, Canada, Hong Kong, China, and the United States. Collaboration with such agencies to stop illicit drugs and other contraband pre-border has been paying dividends, with many notable methamphetamine seizures in particular. A big part of the success has come from information sharing, and NZCS staff being on the ground in other countries to assist with operations and intelligence gathering. This better CBM approach is also at the forefront of how remaining real time R&I tools, to be delivered as part of the JBMS project, will be implemented. While progress on implementation of these tools was slowed to focus on completing the TSW, it has allowed us to re-think some design aspects, and implementation in general. For example, the tools will now be available to all New Zealand’s border agencies to use, and they have also been designed for the mobility platform used by frontline staff. I am confident that these real time tools will add huge value, and lead to positive outcomes and interventions at the border. Our TSW has been prioritized. A key reason behind this decision is that, if we want to maximize our R&I tools that are still to be implemented, we need two years of rich TSW data, based on the WDM3. We felt that it was important to get the information flowing first, so that the tools could do their job once they had been implemented. NZCS believes the richer WDM3 data will provide us with much better insight into border risk, and lead to more targeted interventions. In terms of the TSW, right now we are making final preparations to launch the completed system (for goods and craft) in just a matter of weeks. As denoted in the illustrative diagram, the completed TSW features four new lodgements. It also has increased functionality across the system. 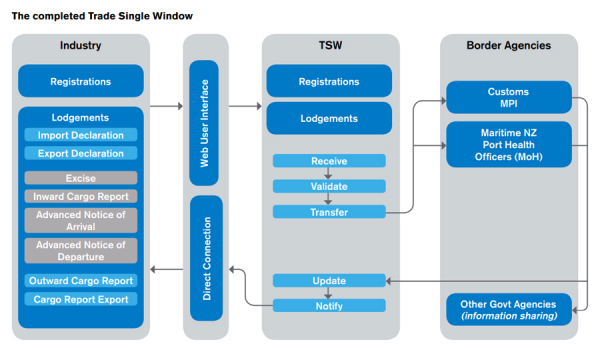 Providing officers with full access to transactions in the TSW, so that they can help traders with any issues that they might have with their messages. In keeping with the approach taken prior to the release of any functionality in the JBMS project, NZCS has worked very closely with industry during the various phases. We have done rigorous testing with a select group of traders to ensure it works well for them, and to flush out any unexpected issues ahead of our ‘go-live.’ After the completed system is in place, we will then consult with industry on mandatory dates for all traders to adopt the WDM3 message sets. So, it is a busy time for us here at NZCS, as we prepare to mark another milestone with the completion of our TSW. It has not been easy at times, but it is definitely worth it. And, given that border modernization never really ends, I am excited to see where the next major developments in border management will take us. For more information on New Zealand’s TSW, please have a look at a presentation we prepared for New Zealand Parliament representatives in December 2016.